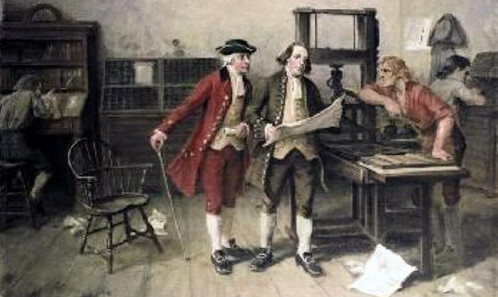 The original OB Rag was modeled on Ben Franklin’s Daily Gazette. Patty tells me that the OB Rag has to make the server switch this week and no later than next weekend. Our call for help has been fruitful – as we have raised $175 just since Friday. We need another $225 and must ask our readers and supporters for additional help. Help us continue to bring neighborhood news, analysis and progressive views to 1500 to 2,000 readers daily. Another $25 just came in. Thank you. $25 and $10 just came to us via PayPal. Mucho gracias, amigos! Another $15 via PayPal and a $100 check just arrived in our mailbox. We’re down to $50! A $150 donation thru paypal from yesterday finally made its way into our gmail account. Wow! We have at least hit $500 in donations – over our goal. Wow! It really makes us feel good when our readers and supporters step up like this. Patty has already begun moving the smaller files … thanks everyone so much. Newer Article: Can Our Children Learn to Study War No More from Mice?